Melissa Gifford - Independent Stampin' Up!® Demonstrator: More fabulous animals! Hi everyone, I have some more fabulous animals for you today - a kangaroo and a baby koala! It doesn't get much more Aussie than that right? Thanks Stampin' Up! 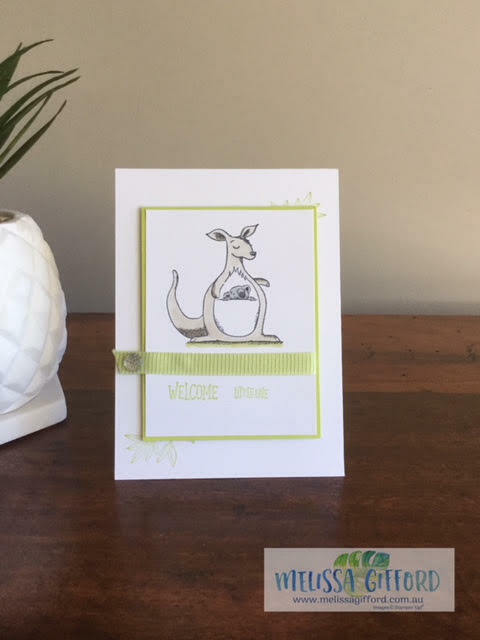 I wanted the kangaroo to be the focus here so I coloured her (and the baby koala) with my blends. It does not show up too well in the photo but there are some green leaves on the top right and bottom left corners. I used white and lemon lime twist for a crisp combo. The two sentiments 'Welcome' and ' Little One' seemed very apt for this pair. The kangaroo, leaves and sentiment all come from the same Animal Outing stamp set due to be released 1st June 2018. The lemon lime twist ribbon is retiring 31st May 2018.